One of the great things about Portland is the system of community gardens that the city operates throughout its jurisdiction. Since the first garden opened in 1975, the program has grown to 43 locations serving more than 1600 gardeners. 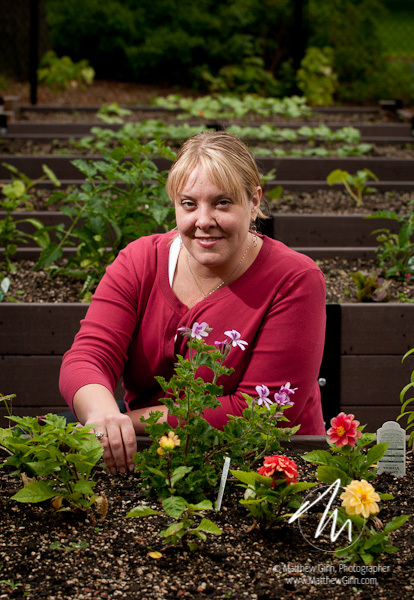 Program Coordinator Laura Niemi took the reins of the community gardens program last year. With more than 1000 families on the waiting list, she has the program on an aggressive growth trajectory. Several new gardens have opened in the past 12 months, and others are under construction. I met Laura on a grey, drizzly “will-it-or-won’t-it” day in June, at the community garden in southeast Portland’s Ed Benedict Park. The garden, which just opened this spring, is already mostly occupied. As well as traditional beds which range from 100 to 400 square feet, the garden includes a handful of raised-bed plots available for people who need something more accessible. These worked wonderfully for our purposes, bringing the agriculture up closer to Laura’s face to establish the connection between her and the gardens.